Not to nitpick, Stevez, but a Chicago hot dog does include tomatoes, sorry you're wrong. I've been eating them my whole entire life. HOW TO MAKE YOUR OWN "CHICAGO STYLE HOT DOGS"
Last edited by RiverWester on November 6th, 2007, 5:20 pm, edited 2 times in total. 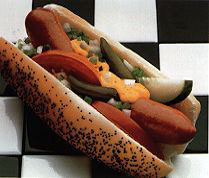 RiverWester wrote: Not to nitpick, Stevez, but a Chicago hot dog does include tomatoes, sorry you're wrong. I've been eating them my whole entire life. Steve's point is that many people (who have also been eating them their whole entire lives, like steve and myself) disagree on that point, and on that point he is correct. There are many hot dog stands that sell Vienna hot dogs that do not include tomatoes as part of a "hot dog with everything". RiverWester wrote: Not to nitpick, Stevez, but a Chicago hot dog does include tomatoes, sorry you're wrong. Not on my Chicago hot dog they don't. Jimmy's also doesn't have a poppy seed bun. eatchicago wrote: There are many hot dog stands that sell Vienna hot dogs that do not include tomatoes as part of a "hot dog with everything". They cut corners and they don't do it right. Are you going to argue with Fluky's, Vienna Beef, David Berg and RedHot Chicago? all of them? Last edited by RiverWester on November 6th, 2007, 5:21 pm, edited 1 time in total. They cut corners and they don't do it right. I dare you to walk into Jimmy's or Gene and Judes and tell them that. Isn't Jimmy's the place they don't give out ketchup too for the fries? I went there once, never again. Demon Dogs also cut some corners too in that regard. I think Chicago needs a D.O.C. denomination for Chicago hot dogs, so that people can know they won't get corners cut on them. A sign outside would help a great deal. As it is most places already don't match the Vienna sign they hang in their own stores. Cheap-*sses. There are places that put ketchup and lettuce on hotdogs also. Maybe they're the "real" Chicago style. Maybe the more slop you can pile on, the better the hotdog? It's ingredient one-upsmanship, IMO. Things like tomatoes, lettuce, and pickle spears, are a more recent addition to the "list" of what consititutes a "genuine" Chicago style hotdog. And I think that it is overkill. Any day now some boneyank will start putting chopped olives or something on his hotdog to make it "better", and start a new round of ingredient escalation. In 20 years, a Chicago dog will probably have a dozen or more ingredients and look more like a chef salad than a hotdog. If I get a hotdog with that slop on it, I pick it off and eat it separately or throw it away. And don't even think about giving me a hotdog with ketchup on it. The Chicago hot dog as described in the aforementioned pics has existed long as I have been alive, with nothing "new" added to the list. If someone wants to go back to WW2 era and make some claim that it had less, then fine. Since the 1960's, it's been the same. That's going on 45 years now with no changes. RiverWester wrote: The Chicago hot dog as described in the aforementioned pics has existed long as I have been alive, with nothing "new" added to the list. If someone wants to go back to WW2 era and make some claim that it had less, then fine. Since the 1960's, it's been the same. That's going on 45 years now with no changes. I can think of a place that added lettuce in my lifetime and another that added cucumbers, and I'm younger than you. You are never going to win even when you are right! Tommy2dogs wrote: You are never going to win even when you are right! The point that was trying to be made by stevez is that no one is "right", that there is more than one interpretation of a "Chicago hot dog". Many hold steadfastly to Vienna's glossy marketing materials, claiming that if you do not construct the hot dog in their manner, then it is not a Chicago hot dog. There are others in Chicago who added even more to the dog when they dragged it through the garden (cucumbers, lettuce, cabbage). And finally, there are many others who come from the world of mustard and onions (and maybe peppers and relish). My father was mustard-onions only and he always said that most of the hot dog stands he ate at growing up were "mustard and onions" kinda-places and he was never crazy about the places that "made their dogs look like the Vienna sign". What's wrong is to say that every other interpretation is wrong and to say that those places are "cutting corners". Someone who loves food, Chicago, and hot dogs, and isn't aware of those interpretations should be excited to hear about them, excited to try them, and anxious to learn more about their history. It's wrong to be dismissive and certainly against the spirit of this community. Another ancient Chicago hot dog stalwart that has never used tomatoes (well, not fresh ones, anyway... and I always thought of the pickled tomato wedge as a side). And there are many, many more. Taking the stance that there is one true way, RiverWester, is ignoring an awful lot of Chicago history and an awful lot of lifetime Chicagoans who have, I suspect, been producing and eating hot dogs a lot longer than you. If you started randomly selecting Chicago hot dog stands, I suspect you'll find that the narrowest interpretation of the Vienna standard is actually a minority. For the record, I generally like the tomatoes when offered. But I don't consider its Chicago authenticity to hinge on whether or not I get them. Last edited by Dmnkly on November 6th, 2007, 8:01 pm, edited 1 time in total. That was Superdawg, BTW, in case you didn't recognize it. Not to date myself too much, but I can remember when tomatoes were considered a novelty item. Obviously, they eventually caught on. Even if tomatoes, cukes or other vegital items are offered, I'll always order my usual toppings of mustard, relish and hot peppers (I'm not a fan of onions, so shoot me). That's not to say you shouldn't order a hot dog the way you want it. There is no such thing as the "right" way. If you want to define the original Chicago hot dog as the kind you grew up eating, then fine. If, however, you're willing to look at its history you'll find things aren't quite so simple. Vienna Beef has been quite successful at pushing their version of Chicago hot dog history and would have you believe that the canonical 7 toppings go back as long as there were hot dogs in Chicago. I'm not at all suggesting that tomatoes etc were never found on long-ago Chicago dogs, only that elaborate toppings became common more recently. You don't need to go back to WW2; simply looking at the hot dogs sold by the remaining old places is very informative. In another thread, I compiled a list of existing hot dog stands that are over 50 years old: Fluky’s (1929), Jim’s Original (1939), Fred and Jack’s (1946), Gene and Jude’s (1946), Polk and Western (1948), Al’s Red Hots (1953), Jimmy’s Red Hots (1954), Harry’s Hot Dogs (1955). While this list isn't complete (additions are very welcome! ), it's interesting that only Fluky's sells the fully dressed dog; the rest use more minimal toppings. I suppose you could argue that these old places "cut corners" over the years but I don't think that's the case; most have been serving hot dogs same the way for over half a century. Fluky's is the exception and indeed they may be responsible for popularizing the elaborate condiments. It's interesting you show pictures of hot dog signs to support your claims. If you look at older Vienna Beef signs, however, you'll find the hot dogs aren't as elaborately dressed. I notice that while I was composing this, others made many of the same points. I'll go ahead and post this as is, even if it is a bit redundant. Rene G wrote: In another thread, I compiled a list of existing hot dog stands that are over 50 years old: Fluky’s (1929), Jim’s Original (1939), Fred and Jack’s (1946), Gene and Jude’s (1946), Polk and Western (1948), Al’s Red Hots (1953), Jimmy’s Red Hots (1954), Harry’s Hot Dogs (1955). While this list isn't complete (additions are very welcome! ), it's interesting that only Fluky's sells the fully dressed dog; the rest use more minimal toppings. Rene G wrote: It's interesting you show pictures of hot dog signs to support your claims. If you look at older Vienna Beef signs, however, you'll find the hot dogs aren't as elaborately dressed. Vienna wants to sell hotdogs, not toppings. It's hard to imagine how you could even see the hotdog itself on one of their signs if they covered it with all of the toppings people are mentioning. I don't think tomatoes or pickle spears started coming into common usage until sometime in the 70's. Before that it was usually just mustard, relish, onions, and sport peppers. I'd like to note, also: No poppy seed bun in any of those designs. Vienna used to have an artist on staff that hand painted all of those old signs. No two are exactly alike, although all used only the traditional mustard relish and onions as the ingredients. If you look at one closely, the artist signed all of them with his initials somewhere within the relish. Once he died/retired, they went with a standard illustration, which is still used today on the extruded plastic signage they now distribute. I would imagine that some of the older hand painted signs are collected as works of art. You just blew my mind. I really thought I knew a few things about Chicago food history. I realize now that I am but a humble novice. gleam wrote: I'd like to note, also: No poppy seed bun in any of those designs. I'd not taken notice of the lack of poppy seeds on those signs. Where/when did the use of the poppy seed buns begin? The first hot dogs (outside of my home) I can recall eating were purchased from a man who pushed a cart down our street most nights of the week, to a corner at the end of the block - across from the firehouse at 69th & Justine St., on the southside of Chicago. . . in about 1958/59. The dogs came in a poppy seed Mary Ann bun and were topped with mustard, onion, relish, tomato, sport peppers and with a sprinkling of celery salt. Though I prefer the simpler - some calling it the "traditional" - presentation of hot dogs, I'll admit that I enjoy the "salad on a bun" style sold by Byron's on Irving Park Rd. near Sheridan Rd., also. Darned if I know when the poppy seed bun became a 'required' part of the Chicago hot dog. I think it's been very common for a long time, but I just don't believe it was or is a mandatory part of the equation. That said, I really prefer poppy seed buns. Maybe Rene G can shed some light on the bun issue. Bill wrote: Though I prefer the simpler - some calling it the "traditional" - presentation of hot dogs, I'll admit that I enjoy the "salad on a bun" style sold by Byron's on Irving Park Rd. near Sheridan Rd., also. You're not alone on this one, and I can actually admit that I prefer a salad dog. Grew up down the street from a joint called Tasty Dog. By the time it's all done, you barely even know there's a hot dog in there. Which, in my mind, may not be such a bad thing. It may have even been discussed on this board already, but does anyone remember the Frugal Gourmet episode (in the "... Cooks American" series) where Jeff droolingly described the Chicago dog as a "salad in a bun?" My mom, born and raised in Melrose Park and a frequenter of Gene and Jude's, Johnnie's, Russell's (yes, they used to have dogs), etc., shouted back at the television "That's ridiculous! Have you actually BEEN to Chicago, Frugie?" The point was that The Frug put on sliced raw onion, coarsely chopped tomato, a handful of lettuce, cucumber, etc., completely drowning the sausage. My folks had NEVER seen a hot dog like this in their youths, and never ordered them that way presently from Portillo's or the other stands we frequented in the Western 'burbs. Even if we were to assume the Chicago hot dog was finalized as late as the 1970's, that's still going on over 30 years now. So, cranky old-timers aside, the 4 major Chicago hot dog manufacturers: David Berg, Vienna, RedHot, and Fluky's all show on their websites today the standard-topped dog and the poppy seed bun. They all show tomatoes. ALL OF THEM. I think those 4 are probably the best authority we have as to the definition. Today, in the 21st Century, if some place is not doing it right, you can be more than likely assured they are simply cutting corners and costs. They've had 40 years to get up to speed. Last edited by RiverWester on November 7th, 2007, 2:50 pm, edited 1 time in total.